GeekDad is helping all you non-geek boys with geek girl mates this Valentine's Day, with a list of 10 Ways to a Geeky Girl's Heart. I will vouch for the effectiveness of most of them, especially 1, 3, 5 and 7. And I'm lucky that hubby is a foodie so he's got 6 down pat. Check out the whole article. You've still got time! 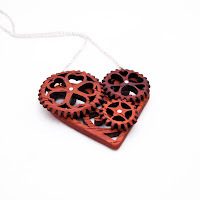 And if you are totally loving that Steampunk Heart pendant shown above, buy it at Xylocopa.